In life, a critical point might describe the time you said yes (or no) to a life-changing opportunity. In physics, a critical point also describes a kind of crux—you can think of it as a point beyond which things change significantly. Critical phenomena is a phrase that describes physical processes close to a critical point. Imagine that you have a bunch of matter concentrated into a tiny volume, so that it is right on the verge of forming a black hole. How do you tell if the matter will collapse into a black hole or persist in a less mysterious form? In previous work, scientists have shown that you can describe the way the matter will behave in terms of a critical point. Above the critical density, the matter will gravitationally collapse and form a black hole. Below that critical point the matter can eventually disperse and you’ll be left with regular old flat space. This situation, where the behavior of the system is governed by a critical point, is described by critical phenomena as they relate to black hole formation. 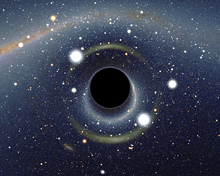 Thomas Baumgarte, a physicist at Bowdoin College, was intrigued by models showing that, just beyond the critical point, the system can collapse into a black hole with an arbitrarily small mass. In other words, most of the mass can be blown away, leaving behind a tiny black hole. Since we can’t create these conditions in the lab, scientists often study critical phenomena around black hole formation with computer-based numerical simulations. In this case, a researcher puts some initial conditions into a mathematical model and a computer program runs a bunch of repetitive calculations to determine how the scenario would play out. The output of the program is a list of numbers that represent the result of the simulation. Most simulations of critical collapse assume that the stuff on the verge of becoming a black hole behaves the same in all directions. Kind of like an onion, they assume that the system is spherically symmetric—the same at any given distance away from the center, independently of the direction. This assumption works fine for a lot of cases, but not all. Baumgarte was particularly interested in rotating systems. How is a collapsing system affected by rotation? Does the rotation prevent those tiny black holes from forming? If they do form, do they spin? A rotating system is not spherically symmetrical, so previous models couldn’t get at these questions very well. Baumgarte was well equipped to explore these questions. Three years ago, he spent time at the Max-Planck-Institute for Astrophysics developing a computer code that runs numerical relativity simulations. His code set up the world a little differently than others. Many numerical relativity codes are based on Cartesian coordinates, the (x, y, z) grid system you might recall from math class and that you depend on when you get stuck with a paper map. Baumgarte’s system was based on another coordinate system, called spherical coordinates. You can describe the same points in Cartesian and spherical coordinates, but spherical coordinates more simply describe where things are on a sphere (hence “spherical”). This makes some problems much easier to explore. The code can explore a relativistic system (like the formation of black holes) that is not spherically symmetric and do so in a spherical coordinate system—a winning combination for exploring these tiny black holes numerically. After putting in the numbers and letting it run for different cases, his simulations showed that small, non-spinning black holes can form even when the mass is rotating before the collapse. At this point Baumgarte sent his results off to Carsten Gundlach, a mathematician at the University of Southampton and an expert in critical collapse. Gundlach had attacked this problem before using a completely different approach. His results also indicated that rotation wouldn’t influence the formation of these small black holes, but this was the first time it had been confirmed numerically. Working together, the two researchers were able to generalize results from Baumgarte’s simulation and express the mass and angular momentum of black holes in a new way. Their joint paper highlighting this work will be published in Physical Review Letters in early June.